(Text automatically translated) The house is situated in a lovely location, with views of Mount Etna (plants reached in 25 min.) And the Gulf of Taormina, is 20 km from the city of Catania., 35 km from Taormina. (Highway A18), from Syracuse 80 km.e from Messina km.80. Only 600 meters away you can find mini-market, bar, tobacco shop, pizzeria, fuel station, ATM service to and access to high km.6. And 'possible to reach the sea in the beautiful lava rocks is only 8 km. is the lovely pebble beach 25 km. The garden surrounding the house, with the color and the scent of its flowers, makes it fresh and relaxing away from the chaos. We had a fantastic week in Maria's house. I late October you can expect some rain, but we had unusual large amounts of rain pouring down. The good side of this was we really could enjoy the large house and all its facilities. The house is really cosy and very pratical for families with children or a larger group of travellers. The house is ideal for exploring the whole eastern part of Sicily. Maria is a wonderful and caring host and thanks also to Laura also for helping with internet connection and other things. We loved it. A big house and beautiful garden. Location is great if you love the country, between the ETNA and the sea, few km to any place. Maria the owner took care of everything we needed. The place was much above our expectations. Great views from the balcony all around. Our family of 6 adults had a great time staying there. 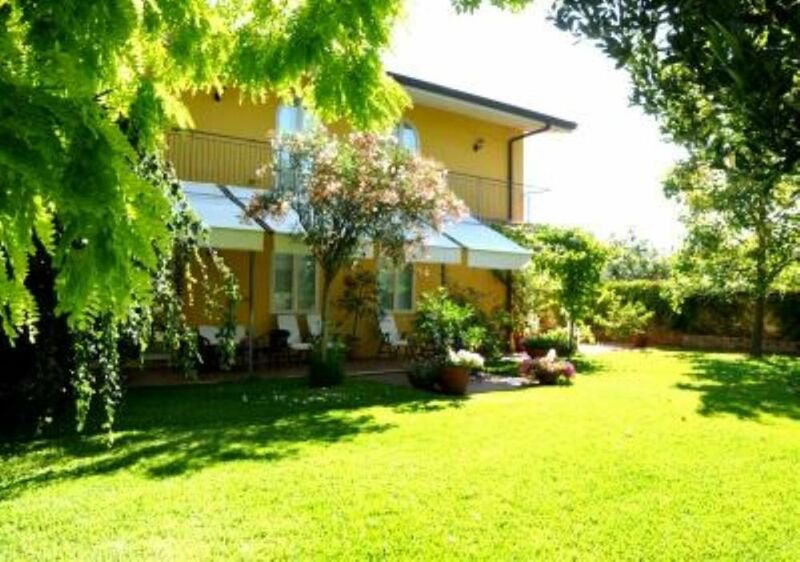 This is a lovely spacious villa set in an enormous private garden. The rooms are very generous, including a huge lofty double height living/dining room. Outside there are extensive lawns, sunny patios, shady veranda's and trees and a large canopied dining area with table and chairs to match. The villa is in a wonderful elevated position with fabulous views of Etna, the coast, sea and surrounding countryside. It's in a very convenient location for visiting the many outstanding places of interest in this part of Sicily. Maria and her family couldn't be more helpful and friendly. This has clearly been their family home and as such has all of those added extras that enhance the overall holiday experience - the garden even boasts a family of tortoises. We had a great time. "We have spent a wonderful week in "casa Tartaruga". Maria and her husband made &#8203;&#8203;us a very pleasant stay with their kindness and sympathy. Even they gave us a beatiful gift at the end of our stay. The house is very comfortable and is located at the feet of the volcano. A fantastic place to start exploring the island. We recommend this house to everyone who wants to travel to Sicilia." Wir durften eine Woche in der Casa Tartaruga verbringen. Das geräumige und saubere Haus ist geschmackvoll und top eingerichtet (WLAN auf Anfrage). Die Küche ist mit allem ausgestattet, was wir für den Aufenthalt brauchten. Grundlebensmittel waren alle da. Nach der Ankunft am Abend wurden wir mit den Lebensmitteln für das erste Frühstück begrüßt und später auch mit ihrem schon viel gelobten selbstgemachten Pistazienkuchen verwöhnt. In allen Himmelsrichtungen befinden sich Terrassen und Veranden, so dass sich je nach Tageszeit ein gemütliches Plätzchen finden lässt oder der Blick auf Etna oder die gesamte Meeresbucht genießen lassen. Die Innenräume bieten durch den offenen Wohnraum ein sehr großzügiges Ambiente. Die Kinder haben die Sitzgruppen auf der Galerie als "ihr" Reich entdeckt. Das Klavier funktioniert und wurde von uns ausgiebig genutzt. Im wunderschön Garten mit verschiedenen Obstbäumen war viel Platz zum Spielen und Entspannen. Für uns war die Lage ideal zur Erkundung des Etna, von Taormina, Aci Trezza und Siracusa. Maria hieß uns mit sizilianischer Gastfreundlichkeit willkommen. Im Ort (ca. 5 Min. per Auto) gibt es ein kleines Lebensmittelgeschäft für den täglichen Bedarf. Zur Autobahnabfahrt Acireale sind es ca. 10 Min. Zum Abschied lernten wir noch die Schildkröten kennen. Wir haben den Aufenthalt sehr genossen, vielen herzlichen Dank. Casa preciosa con unas vistas sobre el Etna y el mar espectaculares. Empezare por Maria, atenta, servicial y ha procurado con sus atenciones a que nuestra estancia en su casa, haya sido muy satisfactoria, su marido igual. La casa preciosa, limpia y perfectamente ordenada con un jardin increible y bien cuidado. Hemos pasado una semana agradable y nos vamos satisfechos de haber elegido esta casa. Muchas gracias por todo.